In my line of work, I am always reading. Whether preparing for a presentation, finding new material for my students, or researching for a writing project. I review various books, magazines, blogs, and web articles most every day. This is one of the many benefits of my career—I am always learning. The downside, though, is that I do very little leisurely reading. I seldom make time for reading what one might call enjoyment. You know, reading simply for pleasure; not for professional purposes. No pen in hand to underline important passages or concepts. This past week proved different. My wife and I spent a week in Jamaica celebrating our 35th anniversary. We totally disconnected from our usual world. No cell phone, no email, no computer, no newspapers, no television news, no business or work-related projects. A total mind enema. We dedicated the week to ourselves; recharge time. And among the things I chose to do was read purely for leisure. 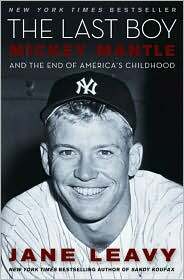 The book: Jane Leavy’s The Last Boy: Mickey Mantle and the End of America’s Childhood (Harper Collins, 2010). So how do you write about a man you want to love the way you did as a child but whose actions were often unlovable?… This is my attempt to understand the person he was and, given who he was, to understand his paradoxical hold on a generation of baseball fans, including myself, who revered The Mick despite himself, who were seduced by that lopsided, bucktoothed grin. Leavy did not disappoint. The book is a wonderful read. It was Mick and me on a Jamaican beach. A rare treat to read for no other reason than enjoyment. Aside from the book and the joy of reading, this experience reminded me of an idea I had a few years ago for an article. As I was walked the beach one summer day, I did notice the ubiquitous paperbacks. People everywhere with their books folded back; engaged in the written word. I thought it would be interesting to ask these leisure readers two questions: 1. What are you reading? 2. What drew you to that particular book? So with the Jamaican breezes a memory and the Mick still fresh in my mind, I’ll toss the questions to you: 1. What leisure books do you have on your short list for summer reading? 2. What about the books (or authors) have attracted you to those books?